What pressure are you running? Pressure is too high, but not hopelessly outrageous. The system will probably run just fine cutting out at 1.5 psi. That said, condensate pumps are an invention of the Devil, intended to annoy and upset people managing steam boilers. You need to modify the system, so that the pump, which will now be a boiler feed pump, is controlled by the level of water in the boiler, not the level in the condensate receiver. Then the level of water in the condensate receiver will control an automatic water feeder, but you will need to have an overflow line on the condensate tank to a handy drain somewhere. You also need to find out which safety is shutting the boiler off on an overfill. It's a good idea to do that, but it might be nice to know what is doing it. You may also have problems with slow condensate return. If you can, flushing any wet returns might prove helpful. Your fresh water auto fill could be passing water thru or over reacting when the water level drops before water returns. As said above, your return lines could be slow causing the auto fill valve to respond. Your pump is controlled only by it's own float....not by the boiler?? Get a low pressure (0-3 psi), gauge from Valworx, and verify the pressuretrol is cutting out at setpoint. Did this problem happen after a boiler replacement or has it developed over time? What system updates have been done to this system? Does anyone know why the pump was added; what problem was trying to be solved? Perhaps slow returns then. Maybe the thought was the extra reservoir/accumulator would put more water into the system as it boiled away. 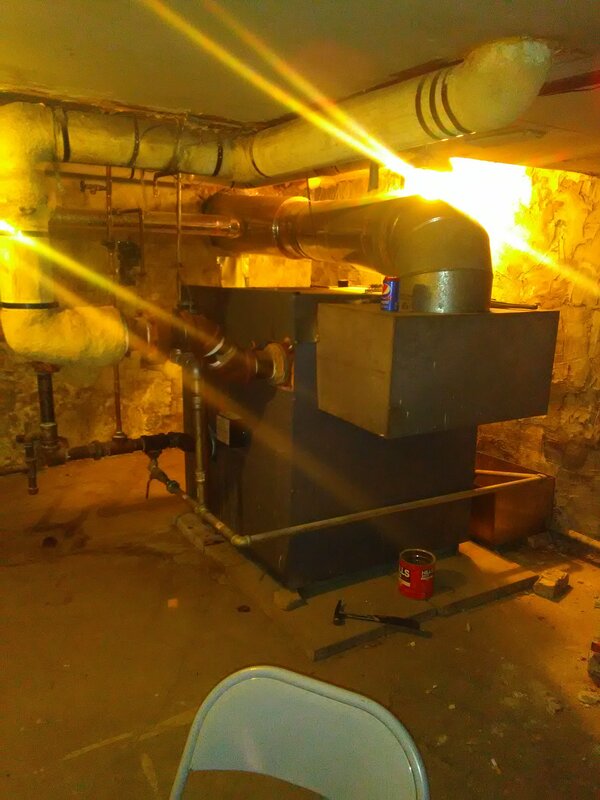 This boiler looks to be shorter than the original. Lower water line might have made some wet returns dry?